A windmill of any size must have a way of getting the power down from the generator to the ground. 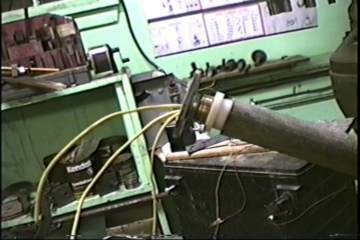 The generator assembly rotates 360 degrees on top of the tower so slip rings and brushes are often used as a means of transmitting power to the house. This is the first one of these we've made - it was fun and a great learning experience. The next one will undoubtedly be some kind of cosmic masterpiece. The hardware stores are full of copper slip rings, they call them sleeves. 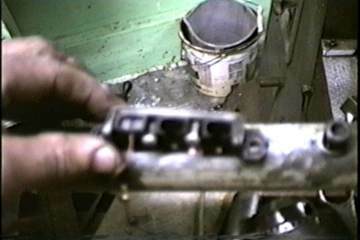 Plumbers use them to soldier two pipes together. 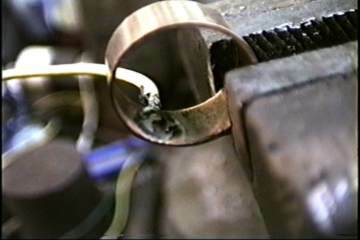 This ring came from a 1" sleeve we cut into 3 sections of about 1/2" each. 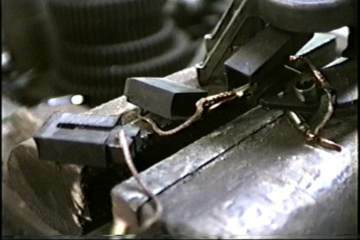 A #12 wire was soldiered into the inside of each of the three rings. 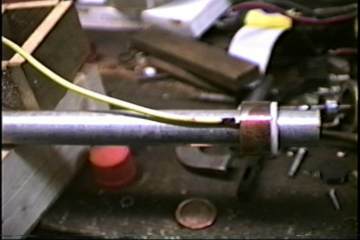 A layer of plastic tape (not shown) was applied to the galvanized pipe and plastic spacer rings were made to keep the slip rings from shorting out. 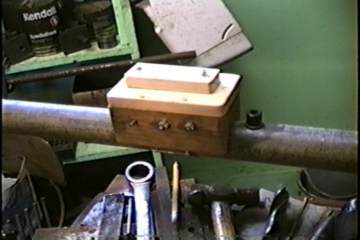 The assembly was then filled with resin to hold everything in place. 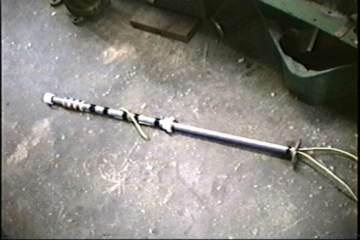 The swivel unit is about 3' long and has a plastic bushing at the top with 3 brass rings. We estimate the electrical load will be somewhere between .005 watts and 650 billion kilowatts. 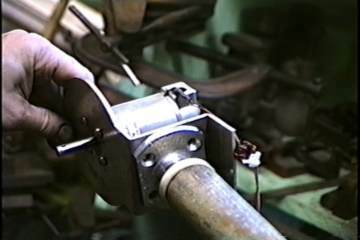 A plastic bearing was installed on the bottom of the swivel unit and a grease fitting was threaded into the 1 1/4" pipe. 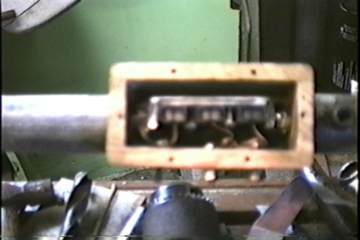 This picture shows the unit inside the pipe with the hole cut out for the brushes. 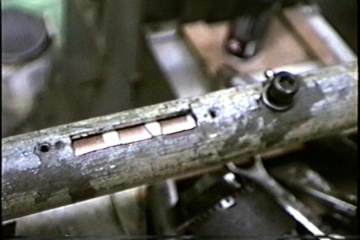 A bolt was threaded into the pipe to lock the swivel unit into the pipe. These brushes and brush holder came from two burned out electric chainsaws. The brush holder had to be sawed out with a hacksaw. 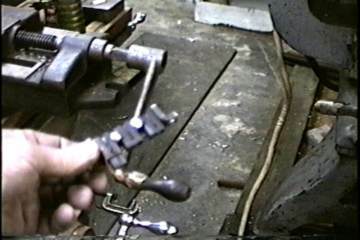 Brushes and brush holder were bolted to a bracket. 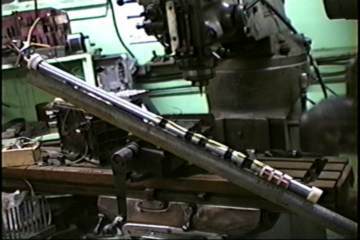 Brush assembly being set into pipe slot. If this picture seems blurry to you, try taking off your glasses. Maybe that will help. 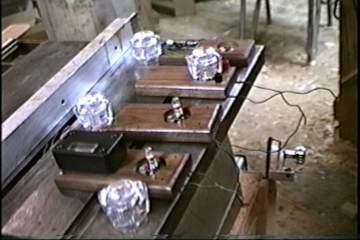 A simple wooden enclosure to keep water out and provide a non-conducting mount for the wire terminals. 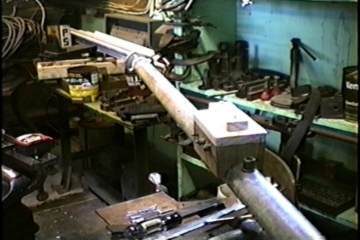 Pole and swivel assembly nearly complete. The generator will be mounted on the swivel slightly off-center to govern the rotor speed. More to come on that next time. The windmill itself will have some LEDs and a 6 volt incandescent light bulb. There are 4 light units that will be inside the house. We'll try to keep the voltage below 440. Each light unit will have 1 6v bulb and 1 other feature.